Are you planning to buy Albucid 10% eye drops online? If yes, then visit our website today. As a trusted name, we offer albucid 10% eye drops at the most competitive prices. The eye drops contains sulfacetamide that is widely used for treating the eye infections caused by certain bacteria such as conjunctivitis. The drops restrict the production of folic acid which is needed by the bacteria for growth. Thus, the bacteria get killed. This medication only kills the bacterial eye infections. And, it will not work for other types of eye infections. We source the medication only from the reliable and authentic manufacturers after checking against varied quality parameters. 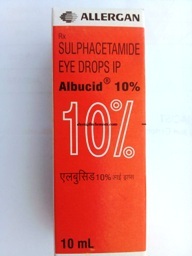 Customers can buy albucid 10% eye drops online from us by simply placing the order. We ensure on-time and safe delivery of the orders.